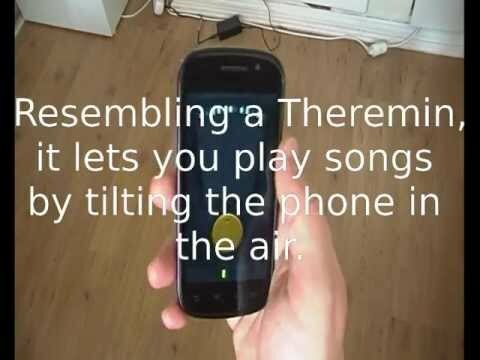 Tilt Theremin is a musical app for the Android platform. Using different sensors, it lets you play melodies in the air like the original Theremin. Now supports gyroscope sensor for devices running Android 4.0+ with a gyroscope sensor (possibly also Android 2.3+). This makes it more like playing on a real theremin than any other currently available theremin app. * 4 different effects: Echo, Chorus, Phaser and Reverb. * Choose between 6 different sounds (2 in demo). * Adjust range of notes playable on 180 degrees rotation of the phone. This makes it possible to have more accuracy and fewer notes, or more notes and less accuracy. * Holding the yellow button in the middle while tilting will pull the range of notes up or down. This makes it easier to reach wider ranges of notes, and can even be used while playing. * Control volume by rotation the device backwards and forwards (gyroscope sensor). * Control volume by sliding your thumb up and down on the upper half of the screen (accelerometer, gravity sensors). * Adjust settings of effects (not in demo). * Adjust sensitivity of accelerometer. * The nagscreen done away with!